Transport Canada has given the go ahead on a proposal to alter shipping lanes in the Bay of Fundy between New Brunswick and Nova Scotia to give migrating Northern right whales a safe passage zone. Paul Doucet, a Transport Canada spokesman, said it is hoped the new lanes will be in effect by the summer of 2003. The lane change was recommended by an advisory group co-chaired by Transport Canada, with the goal of minimizing the risk of whale and ship collisions, the most common killer of right whales. The agency has asked the International Maritime Organization to move shipping lanes in the bay to skirt the area where right whales congregate. If approved, the changes would be made near Grand Manan Island, New Brunswick, where there is an outbound shipping lane. Under the proposal, lanes will be moved about three nautical miles to the east, toward the Nova Scotia coast and away from Grand Manan. Scientist at the Whale and Seabird Research Station at Grand Manan have observed that the mammals tend to congregate on the water's surface in the middle of the lane. The scientists are also concerned about whether the whales can hear approaching ships. Laurie Murison, the managing director of the station and a member of the advisory group that recommended the lane change, estimated that the alteration could reduce the potential for collisions by 80 percent. Right whales travel toward Canadian waters after ending their birthing season off Florida and Georgia. Most spend their summers feeding in the plankton-rich waters of the Bay of Fundy. But arriving at their feeding grounds, unharmed by fishing gear or vessel collisions, is a major feat. As of early May, researchers had sighted two right whales entangled in fishing gear. The first, seen in February off Florida was a male around 21 years old, according to reports by the National Oceanic and Atmospheric Administration (NOAA). The whale was severely entangled in heavy, marine line that was wrapped twice around its rostrum with a looser loop over the back. A second whale seen near Cape Cod was a yearling, seriously entangled with multiple body wraps including lines in the mouth. For updates on the whales' conditions and more information contact Dana Hartley of NOAA at (508) 495-2090 or visit www.coastalstudies.org/. In too many coastal towns along the Gulf of Maine, when it rains, it pours ¾literally. Heavy rains or snow melt can choke the capacity of antiquated sewer systems, causing a treatment plant to discharge excess raw sewage into the nearest stream or beach. Additionally, as rainwater washes over roads, construction sites, animal lots and industrial areas, it picks up oil, salt, grease, pesticides and other pollutants. This runoff usually ends up in storm drains or overloaded sewage pipes and is released into waterways without treatment. The result: beach closings, shellfish restrictions, limits on fishing and other recreational activities. Run-off or leakage from on-site septic systems into ground and surface waters can also cause or exacerbate the problems. Controlling the sewage pollution was the topic of a two-day workshop held in April at the Bedford Institute of Oceanography in Dartmouth, Nova Scotia. Sponsored by the Gulf of Maine Council and hosted by the Nova Scotia Department of Environment and Labour, the workshop included wastewater experts from Massachusetts, New Hampshire, Maine, New Brunswick and Nova Scotia who shared and evaluated sewage management information and explained the current status of sewage management in their jurisdictions. The workshop drew 110 participants including citizens, representatives from government and non-government organizations and the private sector. Andrew Gottlieb, the assistant commissioner for Policy and Planning, Massachusetts Department of Environmental Protection and a keynote speaker, called the combined sewer and storm water pipes found mostly in older urban centers one of region's major pollution concerns. The systems can overflow during storms or snow melts, spewing untreated human waste, industrial waste, toxic materials and floating debris into waterways. Though the systems are "difficult and expensive" to remediate, Gottlieb said, progress is slowly being made. Many of the overflow pipes have been eliminated from the 43 communities surrounding Boston, for example, due to the state-of-the-art Deer Island treatment plant. In addition, Massachusetts is also establishing total maximum daily loads (TMDLs) for pollutants, such as nitrogen, which spill into the waterways from industries, wastewater treatment plants and septic systems. The federal Clean Water Act mandates that states develop and adopt TMDLs for waters affected by pollutants. And to bring on-site septic systems up to code, Gottlieb added, the state now mandates that homeowners have their septic systems approved by state-licensed inspectors before they can transfer the title on their home to a new owner. In Canada, communities are benefiting from a "green" infrastructure program started in 2000, to help provinces and municipalities fund safe drinking water and wastewater treatment projects, said Garth Bangay, the regional director general of Environment Canada, and a keynote speaker. New Brunswick and Nova Scotia will receive more than $100 million in funding to upgrade or build new treatment systems, with several communities already in the process of improving plants. Environment Canada is also developing a four-part strategy to address wastewater contaminants, Bangay said. He added that among the "most exciting" contributions to fixing the sewage problem are the education campaigns by groups like the Atlantic Coastal Action Programs. In one instance, underwater video footage of the sewage in coastal Lunenburg, Nova Scotia, taken by the local ACAP, raised public awareness and gave the town the impetus to take action. "They are now building a new sewage treatment plant as a result of that footage," he said. The workshop provided sessions in sewage treatment innovations, ecosystem health, the costs of sewage management, regulation and enforcement, funding and public education. Four case studies were presented: two chronicling the history of sewage treatment in Saint John, New Brunswick and Bangor, Maine; one on constructed wetlands as tertiary treatment; and a presentation on non-conventional sewage treatment collection in a rural areas. Patricia Hinch of the Department of Environment and Labour and workshop coordinator, said the two-day sessions "provided a tremendous opportunity to exchange experiences, activities, successes and failures. It gives us all a chance to learn from each others' experiences." A workshop report will be available on the Gulf of Maine Council's Web site in the fall (www.gulfofmaine.org). New Brunswick has proposed a new policy to address increasing coastal development pressures. The goal of the policy according to the proposal, Coastal Areas Protection Policy for New Brunswick, is to protect the character of coastal areas while managing future coastal development in a sustainable manner. The draft policy outlines a coastal management approach based on sensitivity to development impact and susceptibility to storm surge. Coastal areas are divided into three sensitivity zones: the areas closest to the water including beaches, dunes, rock platforms, dyked lands and salt marshes; buffer areas; and areas that form a transition from coastal to inland areas. Development would be limited in the most sensitive zones, closest to the water. The policy calls for a 30 meter (99 foot) coastal buffer for salt marshes and is designed to reduce threats to personal safety by storm surges, minimize the contamination of water and wetlands from hazardous materials or other contaminants, maintain flora and fauna and reduce the costs required to repair storm damage to public property. This spring the New Brunswick Department of Environment and Local Government held a series of open houses to seek comment on the proposal in nine coastal communities. Approximately 400 New Brunswick residents attended the sessions, an additional 100 citizens attended three public meetings and nearly 100 landowners, citizens and stakeholders sent written comments. According to figures from the department, 60 percent of New Brunswick's population lives within 50 kilometers (31 miles) of its 5,501-kilometer (3,410-mile) coastline. From 1990 to 1999, 6,268 new coastal lots or parcels were created with an average of 627 new coastal properties a year. Jaime Orser, an environmental planner for the department, said they are in the process of designing an interim strategy for the most sensitive zones based on the public consultations. Regulatory and non-regulatory components, legislation and a stewardship program, will be included in the longer-term strategy for the policy, she said. 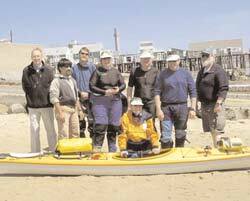 On May 4, a team of two American guides, two retired Canadian educators and volunteers, launched their kayaks from Provincetown, Massachusetts to document the ecology and culture of the 1,000 mile-long edge of the Gulf of Maine from Cape Cod, Massachusetts to Cape Sable Island, Nova Scotia. At community presentations along the way, the team is sharing air quality test results done using ozone sensitive patches, phytoplankton analysis using a field microscope, and water quality tests using electronic probes. Their digital cameras and ultra-light laptop computer are recording the human scene. The records will capture a snapshot of the Gulf as it is today, says expedition leader Natalie Springuel. The Web site for the expedition, www.gomexpedition.org, is being updated several times a week to provide an evolving virtual documentary with a route map, images from the Gulf, observations and journal entries. Dates and activities for each stop are also available on the site. Last month, the U.S. Environmental Protection Agency awarded the Gulf of Maine Council and in particular, seven individuals that inspired its formation with 2002 Environmental Merit Awards. The following people were cited "for their innovative and sustained commitment" to improving the management of the Gulf Of Maine: Bill Ayer of New Brunswick (formerly with the Department of Environment and Local Government), Richard Delaney of Massachusetts (former director of Massachusetts Office of Coastal Zone Management), David Hartman of New Hampshire (director of the New Hampshire Coastal Program), Barry Jones of New Brunswick (formerly with the Department of Fisheries and Aquaculture), David Keeley of Maine (with the Maine State Planning Office), Art Longard of Nova Scotia (deceased, was with the Department of Fisheries) and Peter Underwood of Nova Scotia (formerly with the Department of Environment, now deputy minister of the Department of Agriculture and Fisheries). The awards, given out since 1970, honor individuals and groups who have shown particular ingenuity and commitment in their efforts to preserve the region's environment. This year's competition drew more than 90 nominations. In 1989, the governors and premiers of the jurisdictions bordering the Gulf created the Gulf of Maine Council, an alliance of government agencies working to foster ecosystem conservation and cross-border cooperation.